Want to stock our products? We would love to hear from you. STOCK OUR PRODUCTS IN YOUR BUSINESS. Wholesale enquiries are most welcome. Our current stockists find our tasty 97% fat free jerky snacks a hit. 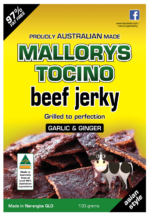 The feedback is that customers love the variety and flavour of jerky meats available. The fact that is a 97% fat free protein snack, it wins customers over! Contact us for more details about our wholesale supplies and prices. Join our existing stockists, who all buy wholesale jerky from us. If you would like to see our products in-store, you can visit any of these stores.